This section is a work in progress! I will add more and broaden the content as and when I have time!! This page looks at general evidence for human achievement, technology and ingenuity in the 2nd and 3rd millennium BC. It is a personal view based on my research and experience of archaeology,traditional crafts, technologies, skills and construction over the last 20 years. The aim of this page is to present some of the remarkable evidence available for this period in order to ask some basic questions concerning our current opinions of British cultural achievement towards the end of the Neolithic Period. 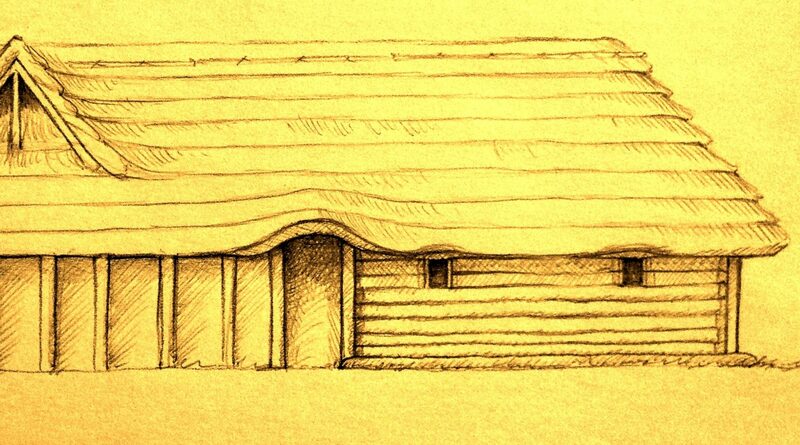 This period is marked by the consolidation of huge monuments in our landscape, and of ephemeral house remains. It is still marked by questions that I feel we should have worked beyond, questions that focus on the creation and complexity of the monuments, the sophistication and scale of farming and landscape management, and the complexity and sophistication of daily life. The current paradigm still seems to be surprised that Neolithic farming communities would be capable of these achievements 4600 – 10,000 years ago. My perspective stems from my research, many years ago, into the Lower Palaeolithic (Early Stone Age). During the course of several projects I replicated and used stone tools from across the Lower Palaeolithic period (around 3 million years ago to around 250,000 years ago), in an attempt to understand the complexity of their manufacture, the sophistication of cognition that was responsible for their production, and the kind of tasks that these “simple” tools were capable of. What became clear was that the so called “simple” tools of the Early Stone Age were more sophisticated that researchers realised. It was only through the replication of those tools, and by recording the specific processes and decisions required to produce one, that their true complexity could be recognised. The apparent “stasis” in stone tool technology during the Lower Palaeolithic was a falsehood based on the opinions of researchers who did not understand the practical and cognitive processes required to produce a specific tool. My research and experimentation in this field taught me a valuable lesson. My perspective of early hominids recognised their very early capability for sophisticated behaviour and thought. The ability to source high quality raw materials, to reduce their overall bulk to a rough out, turning and assessing the core to identify the next place to strike with stone, bone, wood or antler hammer. Their ability to negotiate flaws and difficulties within the stone, and to be able to correct their own manufacturing mistakes (contingent thought), and incredibly, the ability to visualise and pursue a three dimensional object and to work to three planes of symmetry! These were not the abilities of bipedal apes, they were the earliest signs of uniquely human traits and the perfect blend of cognition with manual dexterity. 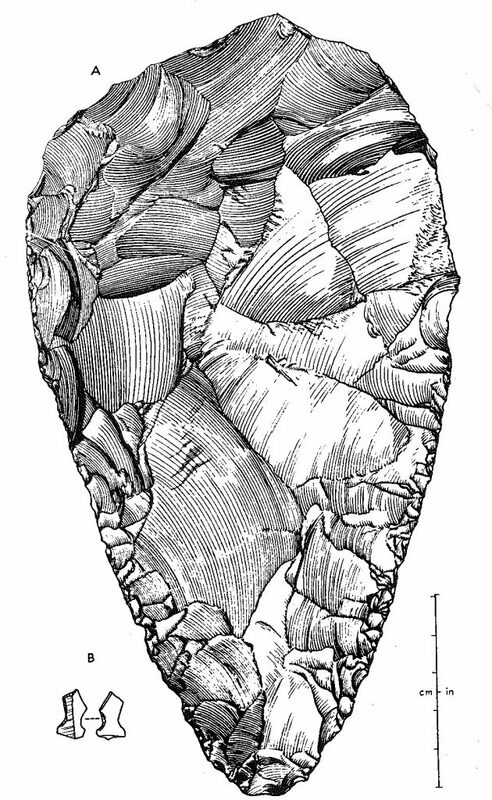 Through practical experiments in a variety of tasks (including butchery), it became clear that far from being “handaxes”, these shaped stones were precision butchery tools that were balanced between fingers and thumb to enable the different cutting edges around the circumference to be used flexibly on a task. Think stone “Swiss Army Knife” rather than Handaxe. We can now take these lessons of clearly sophisticated cognition in early hominids and take a walk back in time to give some perspective to later periods. Lets take a scale of 1cm as a year in time. Pick an imaginary point on the ground and measure out your life in centimetres. Then a metre away we travel back to the Victorians. two metres and we’re at the Battle of Waterloo. We extend the tape 3, 4, 5, 6 metres (600 years) through the medieval period. 10 metres (1000 years) sees us at the invasion of England by William the Conqueror. So ten good strides take us back a thousand years. Twenty strides take us to the Romans, twenty five strides see us into the Iron Age, and thirty strides (3000 years) sees us into the Bronze Age. Seems like a long time ago doesn’t it? Now we walk to the Neolithic – forty five metres takes us to the raising of the great Sarsens at Stonehenge! Five times older than the Norman invasion of England – 50 metres away from your own birthday. Imagine how “primitive” they must have been……? We keep walking – we want to get to the first evidence for anatomically modern humans. We walk and walk to nearly 1.5 kilometres away (150,000 years), and we find humans that look anatomically identical to us living in southern Africa. Their stone tools are very refined, there are styles of tool that change over time and possibly reflect different groups or cultures. Living alongside these modern humans is another type of human. The Neanderthals, those incredibly successful early humans who lived during some of the harshest climatic conditions, exploiting animal and vegetable resources, working in complex groups to live comfortably for over 250,000 years. To walk back to the first Neanderthals, we need to travel 2.5 kilometres. Their stone tools are advanced and demonstrate the ability to conceive a finished tool shape and produce it with a very efficient method called levallois. We now walk into deep human time, the period when several early human species lived side by side or contemporaneously across the world. I will not attempt to name them all here, or to explain their relationships, but suffice to say, their visible technologies are still impressive. They are based on that “handaxe” we spoke of at the beginning of this section. To get to the first of those tools we walk an incredible 1.9 million centimetres (19 kilometres). And beyond that incredible distance, we still have at least another 10 kilometres (1 million years) to discover the first and very simple stone tools being produced by early hominids in Africa. So from our starting point, we have walked nearly 3 million years (30 km) to reach the beginning of this story. We passed the Neolithic period just 50 -100 metres from our starting point (5 – 10 thousand years ago). Doesn’t it seem so very recent all of a sudden? Now, before you proceed, it must be said that the rule of “Uniformitarianism” has serious issues. It is impossible to say as an archaeologist, that if Culture A has something, then Culture B must also have had it! Examples abound in the modern world of temporally contemporaneous cultures being very different – and yet we are all “Modern” humans. As you read this, humans are orbiting the earth in machines that have been built at the cost of billions, while in South America, tribes still exist that live essentially Palaeolithic lives without contact with the “modern” world. 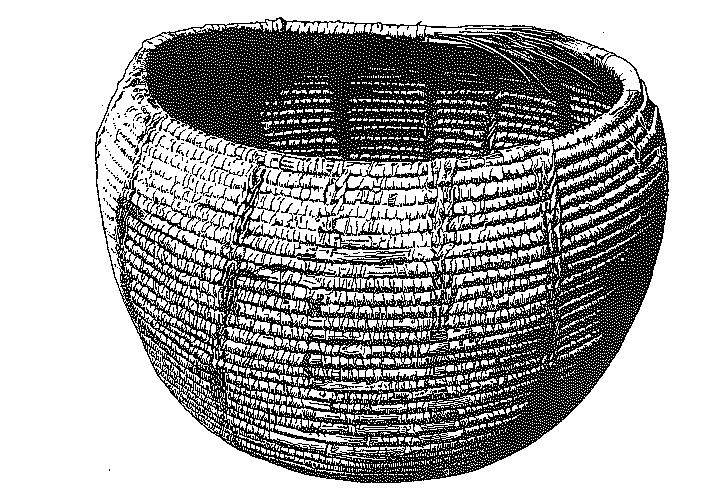 I am certainly not arguing that if a Neolithic farmer used a particular style of pot in the Levant, then another Neolithic farmer was using the exact same style of pot in Orkney. What I am arguing is that they both would have used pots to fulfil a similar function within their farming way of life. 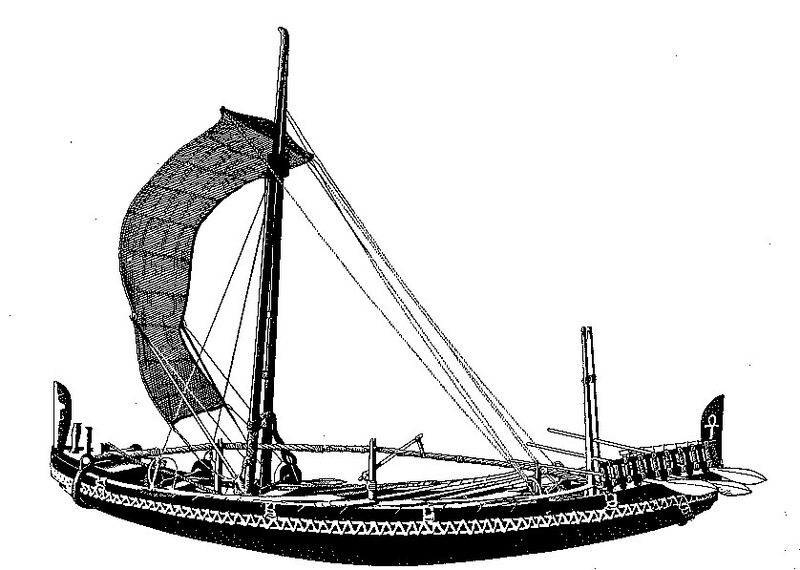 There may not have been the Egyptian ocean going vessels we find as models at 2400 B.C. (Figure 2.) sailing the coasts of Britain, but there would have been ocean going vessels – developed from independent cultures and traditions. Sometimes these traditions spring up independently, sometimes they are directly influenced by cultural contact and exchange. And if you still doubt the existence of ocean going vessels in the Neolithic – 5-10,000 years ago, then consider the human colonisation of Australia at least 65,000 years ago. This voyage (or series of voyages) requires the crossing of the Torres Strait, a 93 mile (150km) stretch of sea with strong currents and 274 separate islands. In order to do this in numbers that go on to colonise an entire continent, this is clearly not one person hanging onto a log and negotiating these treacherous waters, but groups moving from island to island in an organised way – using boats that are capable of serious journeys in open waters. When any human culture (ancient or modern) is analysed more closely, it becomes apparent that, although available materials, landscape, and belief systems differ, each culture exploits its surroundings in efficient ways that uses the properties of available material sets to their best. This exploitation is ingenious and wholesale whether the culture is farming or hunter-gatherer based. The transfer of knowledge and technological development relies entirely on the communication and trade networks that exist between cultures, and these networks in turn, are reliant on the physical landscape that surrounds a specific culture. It is no accident that rapid cultural exchange has always been focused on seaways and coastal regions, and that the exchange has necessarily slowed as more difficult trade routes have ventured into the interiors of continents. The point of this page is to try to reveal some of the achievements that humans were capable of, and exposed to in Europe and its periphery during the Neolithic Period. It is an attempt to open our eyes and bypass some of the preservation biases that we often forget we suffer from in Western Europe. The stone built monuments of our Neolithic period exist in our immediate landscape, but the finer, everyday objects that enabled the builders of those monuments to lead comfortable and successful lives, are harder to come by. It is therefore, tempting to see the stone but miss the LIFE. This often results in a mismatch between the visible achievements (lets take Stonehenge) and cultures that produced them. Stonehenge, or the late Neolithic is a prime example of this discrepancy between visible and invisible evidence. We still hear the cry “How could they have built it?” simply because of our vast underestimation of human capabilities at that time. The lack of anything but stone evidence creates a bias that supports notions of primitive behaviours and lifestyles. Fragmentary organic evidence hints at some of this lost sophistication – but even in “well preserved” excavations, we are missing 95% of what would have been there. Figure 3 gives us a glimpse of the organic remains that must have accompanied the stone monuments. 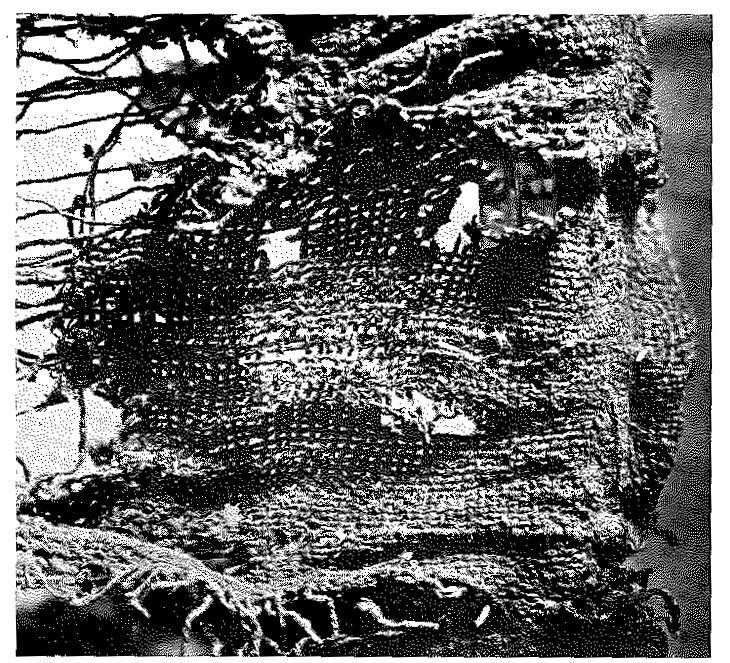 This remnant of linen fabric is amazing at 6500 years old. is shows the processes and refinements of growing a crop for fibre, seed and oil, and the transformation of those fibres into wearable fabric. There is nothing crude or primitive about this evidence, it is fabric we are all familiar with in our own wardrobes. Figure 12 takes this idea to the next level with the addition of fringing and a clear need for something that is both functional and aesthetic. We know that colour plays an important role in the human story, from the use of red ochre crayons by Neanderthal groups at 250,000 years ago at Maastricht Belvedere (Netherlands), and it seems entirely probable – in fact, likely that fabrics and fibres would have exhibited a wide range of colours by the Neolithic Period. Imagine if your home was subjected to the ravages of 5000 years in a temperate climate… What would actually survive? External walls to a low level perhaps, broken ceramics, bowls, plates, rusty metal work? Now look around your room at what wouldn’t survive, the furnishings, the fabrics, the wooden furniture, the flooring, rugs, carpets, the books, instruments, artworks, doors, window frames, in fact the very things that say something about you and who you are, the culture you belong to, the regional and global influences on your life. The Neolithic equivalents of those items are simply lost to us except in very rare circumstances where they are either waterlogged in and air free environment, or desiccated in an arid zone. So we are confronted by the quandary of differential preservation. Our own climate prohibits the survival of all but the hardiest items and materials, and so as purists (scientists), we cannot elaborate on what might have existed. We stare in admiration to the arid zones where Neolithic life is far better represented and rightly we say that to compare directly with the cultures that lived here is “too simplistic”. But in doing so, we also throw out the notion of sophistication in our early cultures. We tentatively wonder, almost embarrassed to ask the question, if the builders of our Neolithic societies and cultures were as “advanced” – culturally sophisticated, as those of the East. Figure 4. Limestone relief from Ur – pre 2500 B.C. We can clearly see that, given a specific set of materials, humans will experiment, adapt and investigate those materials and their properties in order to find their best use for the culture in which they live. 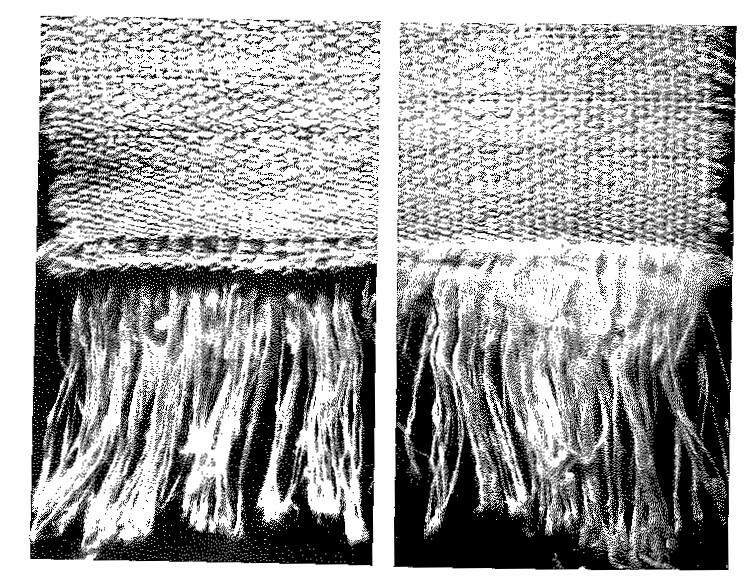 Some methods and technologies are, therefore, “expected” to be discovered by all cultures (the twisting or plaiting of fibres to improve strength, the moulding and shaping of clay). The issue arises with the invention of technologies that take a material and transform its natural use (transforming stone/ore to metal). Figure 5. 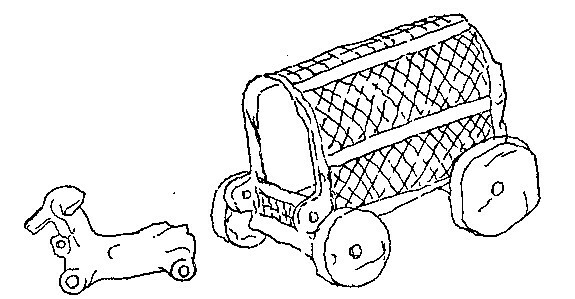 Toy model of a covered wagon from Tepe Gawra, Assyria. 2500 B.C. Figure 6. Tomb relief from Saqqara, Egypt 2500 B.C. showing the process of domestication. Note the tethered wild species being fed. Figure 7. Tomb relief from Saqqara, Egypt 2500 B.C. 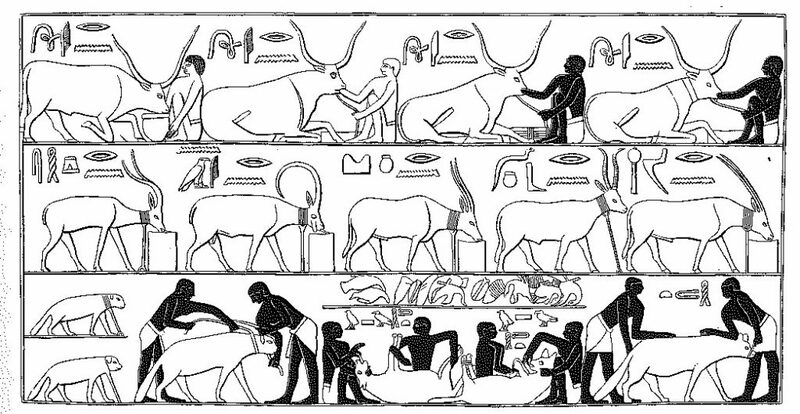 showing the use of domesticates (in this case Asses) to thresh harvested cereals (by trampling). The illustrations above go someway to shattering the idea of domestication as an accidental pastime for Neolithic peoples. Instead, it is tackled as a systematic process of trial and error. A wide range of species are captured, tethered, fed (sometimes force fed) in order to assess their tendency to domesticate. These images force us to see our modern list of domesticated species as only the success stories of a long process that more often than not, ended in failure. How different the world would be if animals such as Ibex, Gazelle and Hyena were everyday domesticates like cows, sheep and dogs! While the great Sarsens are being raised at Stonehenge, we have evidence of domesticated Asses being repeatedly driven across harvested cereals to thresh the grain – and yet the use of traction animals in the movement of those great stones is rarely considered. Figure 8. 3400 B.C. A basket from Gurob in the Fayum, Egypt. Since William Cunnington (1754 – 1810) first used a trowel to excavate Neolithic and Bronze Age sites in Wiltshire, and devised systems of accurately recovering and recording archaeological evidence, we have consistently underestimated the achievements and abilities of our ancestors. What is clear, with each new discovery, is that our assumptions are incorrect. Each new find and excavation confirms that sophistication and ingenuity runs as a continuous thread through the human story. Where evidence survives, that sophistication slaps us in the face and makes us confront our own biases. Figure 10. 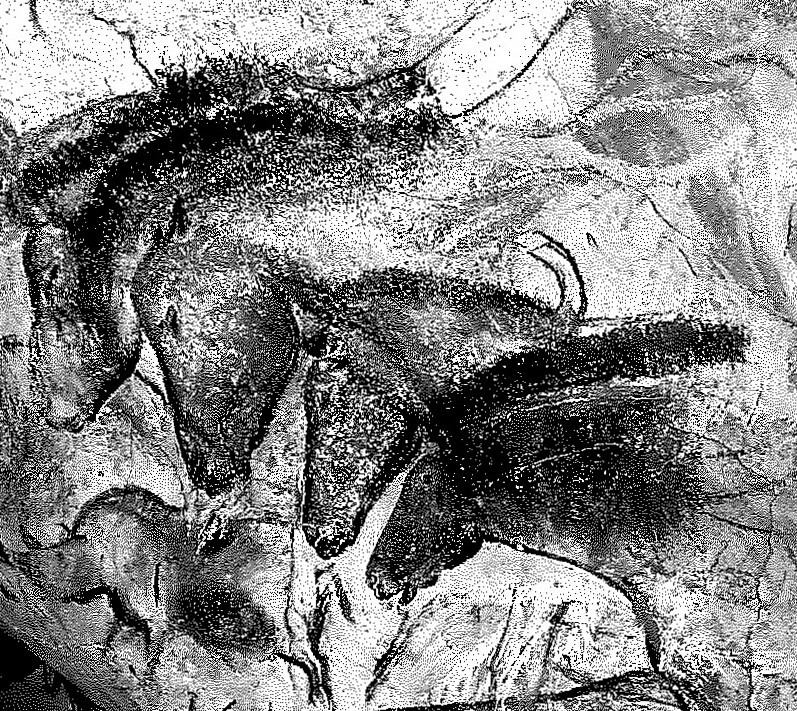 The Horses from Chauvet Cave 32000 B.P. The photograph above shows one of the many astounding collections of wall painting from Chauvet Cave in France. Take a moment to look at the way the artist (or draughtsman) has observed the anatomical and structural detail of the animals. Their curves, their profiles, their detail and even the weight of the horses are brought to life on those travertine surfaces. This is a clear demonstration of the ability of humans to observe, retain and repeat detailed information. Any artist working in the modern world would be happy with the finished results. Now look at the date. This image was completed somewhere around 30,000 years ago. That’s 20,000 years before we currently suppose the Neolithic period was even a glint in the hunter-gatherer eye! Again, we have proof of the sophistication of pre -Neolithic humans, and yet to suggest that monuments such as Stonehenge must have required drawn plans and logistical calculations still raises eyebrows in the academic world. So, let us now revisit the Neolithic world we thought we knew. We visit this world with the knowledge that most of what we see will not survive the ravages of climate and time. As we walk across the Stonehenge landscape we now see well ordered and productive fields, we see the commonplace use of domesticated animals for products, but also traction and agricultural processing. We see teams of designers, working on the detailed plans and calculations for the next stage of monument construction. We see the stratification of society, the command and control systems that can plan, organise and control the coming together of multiple communities at any given time. We see the specialisation of crafts, the basket maker, the tailor, the shoe maker, the farmer, the hunter, the astronomer, the mason, the architect, the artist, the sculptor, the surveyor, the logistics manager, the mathematician, the lumberjack, the leather maker, the potter, the tool maker, the rope maker, the boat builder. This is not the piecemeal adoption of an agricultural system, but the efficient and well organised wholesale move towards the world we know now. It is a move built on 3 million years of experimentation, materials knowledge, landscape management and exploitation, social and cultural development and the discovery, protection and dispersal of knowledge. What we lack is the immediate evidence for this sophistication. The nature of organic evidence determines its destruction in our rich humic soils. But where the land is arid and the soils poor, in those lands to the east and south of our European borders , this evidence exists in abundance. And at every level, it confirms that the adoption of agriculture is part and parcel of a suite of changing and visible cultural sophistication based on sedentary lifestyles. Many of the wonderful pen and ink illustrations in this page have come from the wonderful tome Singer, Holmyard and Hall, 1967 “A History Of Technology. Volume 1; From Early Times to fall of Ancient Empires”. Clarendon Press, Oxford.